About Me | Graham D. Fairhurst, Ph.D. I am an integrative vertebrate biologist with broad interests in understanding how animals interact with a changing environment. 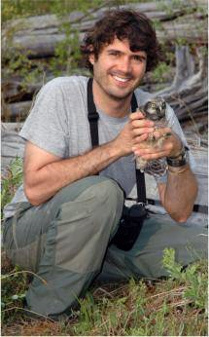 My research uses traditional and rapidly-advancing field and lab techniques to explore questions at the intersection of physiology and behavioral ecology. I work mainly with birds because they lend themselves well to the questions I ask (and because they are fascinating! ), and I have extensive experience with the analysis and application of feather corticosterone. I am motivated by a desire to understand natural processes and apply that knowledge to address contemporary and emerging issues facing bird populations. Part of what I love about my job is being able to work with, and learn from, a variety of people. I greatly enjoy collaborative projects, and I strive to impart an understanding of (and enthusiasm for!) the natural world to others through teaching, training, and mentoring. Copyright © Graham D. Fairhurst All Rights Reserved.